Theatricality, frisson, an unguarded glimpse behind closed doors – the art of a momentous political photograph. 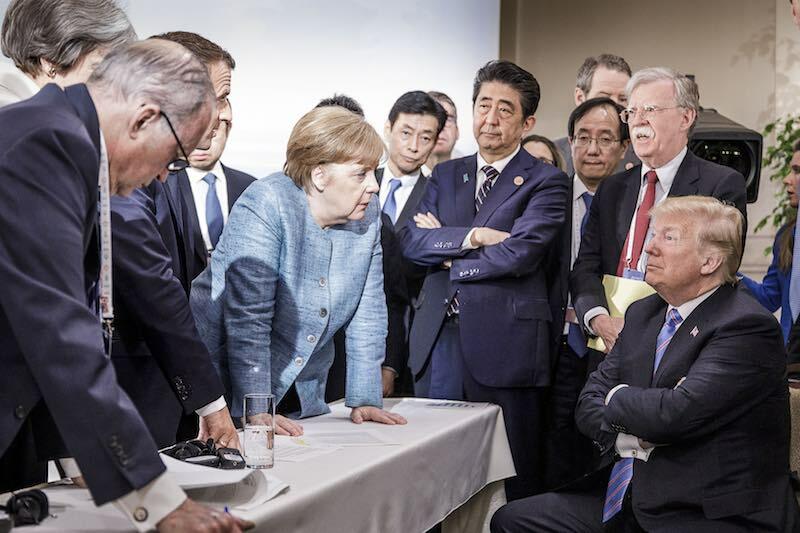 The photograph from the G7 summit at La Malbaie, Canada, released recently on Instagram by German Chancellor Angela Merkel’s team, had the internet buzzing. Jesco Denzel’s image of Merkel in discussion with US President Donald Trump went viral, provoking memes that ranged from an upturned plate of spaghetti Photoshopped onto Trumps’s head to recreations of the image as paintings by Leonardo da Vinci or Rembrandt. One of his posted photographs shows a moment at the same table, with Trump and Merkel in the same opposing positions – except for the fact that in this image, Trump has his hand on Merkel’s and her smiling head is lowered. Same room, different power play. While Trump’s response was typically combative, his tweeted photographs did make the point that, in any given political situation, multiple perspectives exist. Denzel’s photograph, taken in his role as Germany’s official photographer, encapsulated reports emerging from the meeting that claimed the US was isolated against the other six nations over trade tariffs. It also highlighted Merkel as prime negotiator, flanked by fellow leaders Japan’s Shinzo Abe, France’s Emmanuel Macron, and Britain’s Theresa May. Politics and spin aside, looking across the range of photographs released from the meeting, Denzel’s is still the one that will go down in history. And the reasons why are reflected in the memes. The playful takes on Denzel’s photograph in the manner of Rembrandt et al. aligned the photographer’s skills in composition and lighting with those of a figurative painter, who arranges subjects and creates narratives through a carefully constructed composition, and describes mood through light and shade. Another press photograph that got the “like a painting” treatment was the overhead shot of politicians in the throes of a fist fight in the Ukranian parliament in 2014. Despite the photograph’s depiction of a moment of chaos, Facebook user Manzil Lajura observed that its participants could be analysed according to the Golden Mean, the most pleasing of Renaissance compositional devices. Skilled photographic artists can do this too, of course, using posed subjects, lights, or digital manipulation. Photojournalism deals with events playing out as they happen, so when observers align it with the slow work of painters from the Renaissance, the Baroque and Dutch Golden Age, they seem to be giving it a gravitas and longevity beyond the 24-hour news cycle via its aesthetic virtuosity. As an art historian and former broadsheet picture editor, I cringe a little at the idea that photographs need to align themselves with paintings by old masters to bring them into the realm of history-making art. Yet Denzel’s photograph stands out among others taken around the same moment because it cleverly minimises the distractions of the room – the adjacent TV camera, flags, and pot plants, or the presence of less key players. It is taken from a position close to the table – so close that we feel like we’re sitting at it – and the slightly darker light conditions etch character into the faces of his subjects, each caught in a distinctly expressive moment. Denzel’s photograph is compelling not only because of its skillful composition, but also because of its informality. These ideas sound contradictory, but that’s precisely why they make for an extraordinary political image. While its gathering of players around a table might recall, say, the carefully composed Baroque drama of Caravaggio’s Calling of St Matthew (1599–1600), it is also intriguingly candid. Its powerful subjects are captured in a tense moment that not only encapsulates a political mood but also reveals something of the character of its subjects, as human beings as well as world leaders. Around them, another narrative plays out. Macron engages animatedly with an open-mouthed John Bolton, Trump’s National Security Advisor, while Abe folds his arms and looks to Macron. The result is theatrical in its storytelling possibilities. This theatricality is in play with a frisson of excitement from the image being taken behind closed doors. In contrast to the staged “handshakes and signatures” photographs that came out of the Singapore meeting between Trump and Kim Jong-un soon after the G7 summit, we have in Denzel’s photograph a surprisingly elegant image of sleeves rolled-up, high-stakes political history being made in a room, in real time. 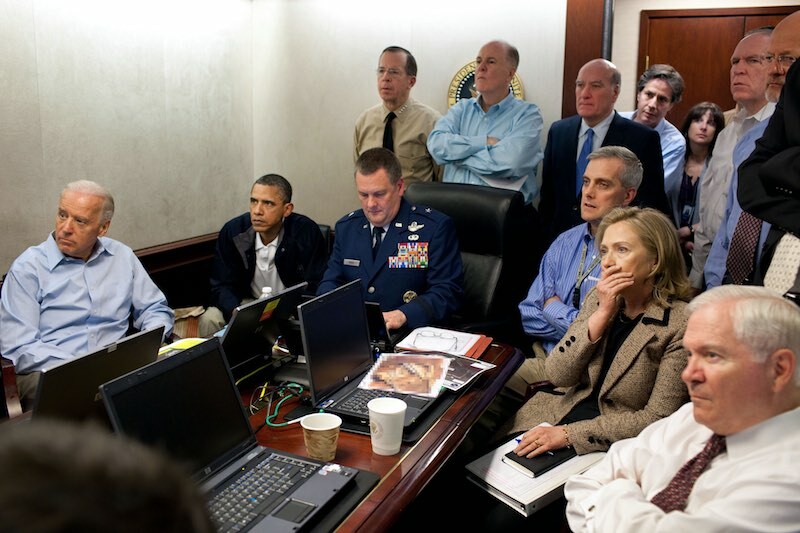 It is a quality shared by former Chief Official White House photographer Pete Souza’s 2011 photograph taken in a small conference room adjacent to the Situation Room at the time of the raid on Osama bin Laden’s compound. Like Denzel, Souza has given us a place at the table of power, with Obama’s security team as they watch a live feed of the operation. And like Denzel, Souza brings us an unexpected human gesture amid the many sets of eyes stoically glued to the feed – Hillary Clinton’s hand clasped over her mouth. Photojournalists also take us to the world of the powerless. 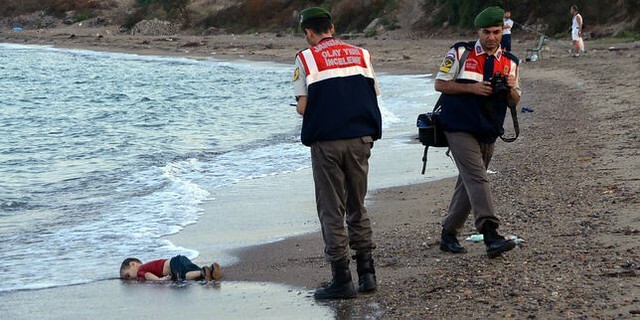 Nilüfer Demir’s 2015 photograph of deceased Syrian boy Aylan Kurdi on a Turkish beach is in devastating contrast to the political and military players captured by Denzel and Souza. The small, lifeless body of this child who had fled Kobani with his family lay on the beach alongside a Turkish police officer, his face partially turned into the sand and the sea. In a single image, it was widely observed that Demir brought forward the human side of the tragedy of the Syrian conflict and the plight of its refugees, making it a defining image of our age. As part of his body of work addressing the plight of refugees, some months later Chinese activist artist Ai Weiwei re-enacted Kurdi’s position, in a photograph taken on a beach in Lesbos, Greece. Demir’s photograph pointed out the opposite – we are not this child, nor will we ever be. While Kurdi’s fate had become symbolic of a crisis of great magnitude, Demir’s photograph remains a picture of an individual – a three-year-old boy with a name, a family, and a life cut brutally short. Nauru is one case where Australia's global interest in promoting democracy is compromised by its specific immigration policy priorities. How did the United Kingdom get itself into such a political mess? The spectacle may be unedifying and cost of failure terrifying, but parliamentary democracy is still alive and kicking.